The addition of a Computer Numeric Control Router and Laser Engraver to the Applied Technology Department will enable students to master 21st century skills in woodcraft and manufacturing. In addition, this technology will allow other departments to work collaboratively with Applied Technology to broaden the scope of their curricula – Math, CAD, Business and Art classes can all make use of this computer-integrated technology to enhance the complexity and effectiveness of design and entrepreneurial projects. The CNC Router and Laser Engraver will also support the expansion of the Toys for Tots campaign, a signature LFHS community service initiative. ​A total of four, high-quality 35mm SLR digital cameras were awarded for photography classes. These cameras give students unmatched exposure to advanced photographic principals and techniques, strengthening the curriculum. The cameras are available for student use both inside and outside the classroom, making photography classes accessible to more students. Students and teachers in other art classes also will benefit from the equipment’s extremely high-resolution images, which are essential to creating and displaying artwork. The Polzin Reflective and Mentoring Program is a fundamental component of our ongoing professional development at LFHS. The workshops focus on specific instructional techniques that directly translate to improved teacher performance. New and veteran teachers are able to learn side-by-side in a supportive culture, building collaboration and communication across departments. ​The Newberry Teacher Consortium in Chicago offers a series of intellectually stimulating, content-based seminars led by scholars from area universities and colleges. The inspiring, one-day seminars give teachers tools to enrich academic content and curriculum delivery for students — as well as the opportunity to collaborate with peers from other districts in the Chicago area. Prairie Mural This grant benefits both Advanced Photography students and Environmental Science/Biology students. Advanced Photography students capture prairie plants, insects, and animals at Elawa Farms, using both panoramic and close-up shots. The high-quality images are then used by science students as important visual aids when studying relevant units. The photographs are mounted and displayed in a beautiful mural in the science hallway to be enjoyed by all. This grant was co-funded with the Association of Parents and Teachers. Water Bottle Filling Stations Student-Initiated Grant The school’s eight current chilled-water fountains are retro-fitted with Water Bottle Filling Stations. Students can fill their reusable water bottles quickly and without touching the equipment. A continuous “Green Counter” on the machine shows how many disposable water bottles have been saved from the landfill — data that can be used in Environmental Sciences classes. Studies also show that hydration aids concentration and promotes learning. This grant was co-funded with the LFHS Class of 2013, Lake Forest High School, Lake Forest High School Boosters, and the Association of Parents and Teachers. Emotional Wellness Support This grant is part of a community-wide initiative to establish the appropriate training, programs, and services to combat depression among teens at LFHS. 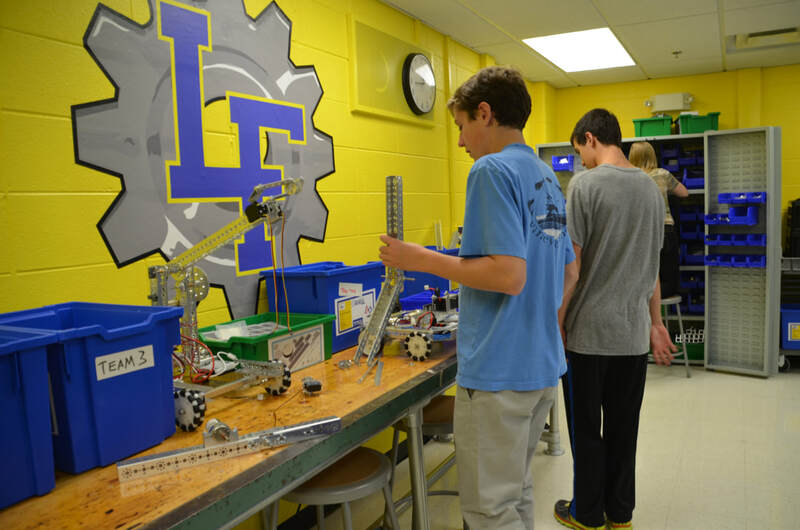 This is a shared grant, supported by the City of Lake Forest, LFHS APT, District 67 APT, the Spirit of 67 Foundation, the Village of Lake Bluff, District 65 PTO, and Alliance for Excellence. iPad Technology for Wellness Following last year’s successful pilot grant, seven additional iPads were awarded to the wellness department. Wellness teachers can customize their iPads with course-specific applications and videos that demonstrate exercise techniques and provide immediate feedback to students on skills and timing. This technology also helps ensure that all students in wellness classes are fully engaged and participating in meaningful physical activity.